Update 5/11: And we have the record breaking tally for this year’s Georgia Legal Food Frenzy contest. We are proud to announce that this year we brought in $12,105and 3,219 pounds of food. Thanks to your generosity, we will be able to provide 65,813 meals for children who are at risk for hunger right here in our community. We would like to send a big thank you to the District Attorney & Honorary Chair, Meg Heap for leading such a tremendous effort this year! Update 4/30: We are proud to announce that we helped raise $565 in the Georgia Legal Food Frenzy contest, which will go to purchase 2,260 pounds of food. 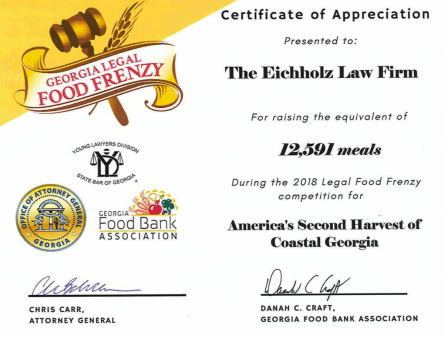 The team of attorneys and staff members at The Eichholz Law Firm are proud to announce their participation in the Georgia Legal Food Frenzy contest. Created as an opportunity for Georgia lawyers to challenge each other outside the courtroom, the contest aims to reduce hunger and help Georgia families. According to Food America, Georgia is one of five states wherein food-security among children is the highest. Since April 20, the firm has been collecting non-perishable foods, including peanut butter, canned tuna, canned beans, pasta and more. More than 250 firms are participating in the contest, those who collect the largest amount of food (based on pounds of food collected) will be awarded the Attorney General’s Cup. Food will be weighed in pounds at local food banks and monetary donations will be counted as four pounds of food per dollar donated. Last year, more than 270 firms collected 1.1 million pounds of food for the Georgia Food Bank Association member food banks. The donations collected were a 36 percent increase over 2013. The Georgia Food Bank Association is comprised of seven regional Feeding America food banks which collectively distribute more than 100 million pounds of food each year throughout the Peach state. The Eichholz Law Firm is excited to once again participate in this contest where the true winners are the one in four families who depend on food banks in our area.